"New Bike Day" is such great and simple joy brought forth by a fundamentally simple machine. You feel like a kid again on the day you got your first 10 speed. Well, almost. Swiping your credit card for a choking huge transaction sort of destroys that fantasy a bit. Oh well. Anyway, earlier this month the search for my new ride ended. It took many months many test rides from shops around DTLA and SFV area. (Downtown Los Angles, San Fernando Valley) I threw a leg over these brands: Trek, Novara, Bianchi, Lunus, Gunnar, Surly, Jamis & All-City, and a few more too. 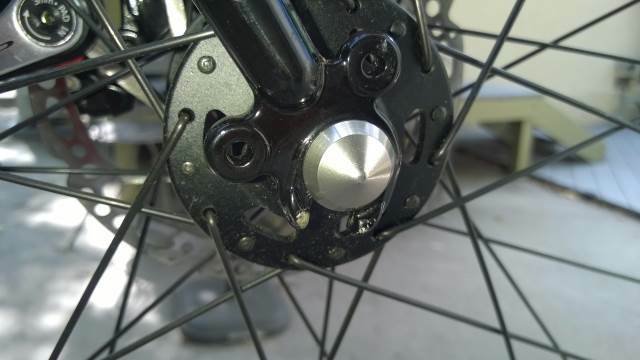 Thanks to my friend and bike enthusiast extraordinaire Steve Ferguson (Oh, let's be real: bike geek) who helped me scour the internet with examples, options and even a well thought out parts list. So much to think about. Many models were near perfect but not quite. I took my search further. 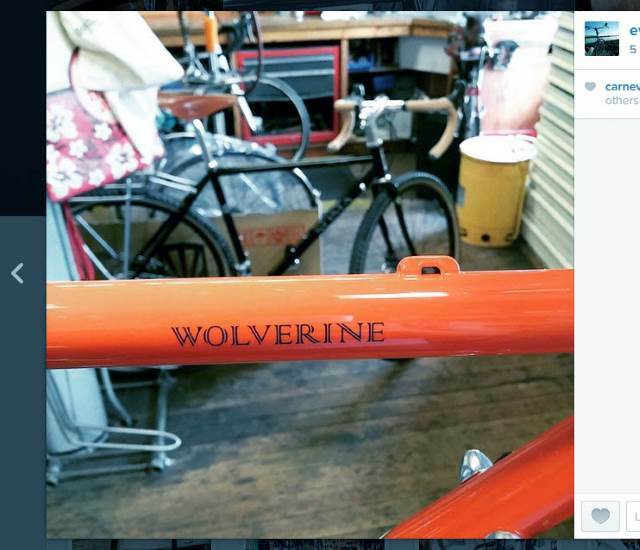 One Saturday, I took a trip to a particular bike shop in San Francisco. American Cyclery (www.americancyclery.com) has the largest selection of SOMA bikes readily assembled for your test riding pleasure - of which I excitedly took advantage of. It's tough to find a place like this in our area. Believe me, I tried. Because the shop is adjacent to Golden Gate Park , it's a great test ride situation. And to test the low gears and brakes, so are the seriously steep hills on nearby Stanyan and Willard streets. In the end, I chose the Double Cross. Still versatile in many ways, the traditional chain drive is more my style. And with my gearing choices, it gives me some really nice low gears needed for my local steep stuff. Brad took all my measurements including inseam, hip, knee shoulder, arm and body weight. All are required for dialing in a perfect rider to frame fit. 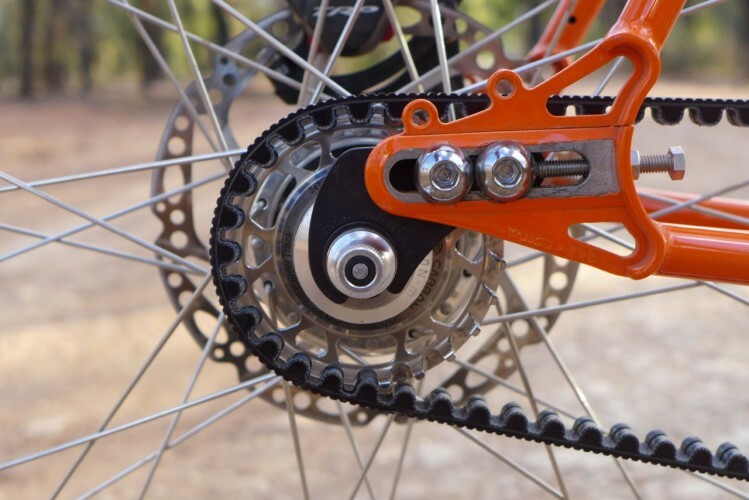 We discussed all the component choices related to brakes, shifters, handlebars, wheels, gears and cogs, tires and saddles. 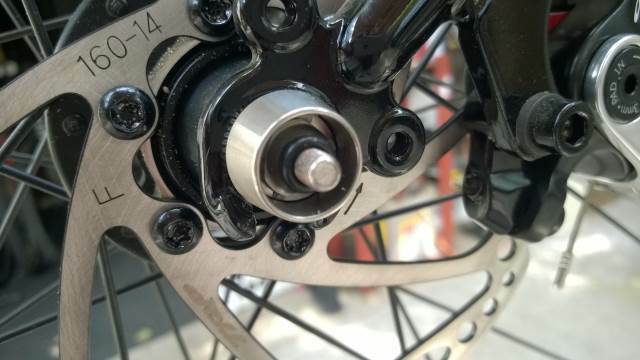 Also he showed me a set of locking wheel axles from PitLock, a great security feature, considering the bike will spend many days locked up at the USC campus. 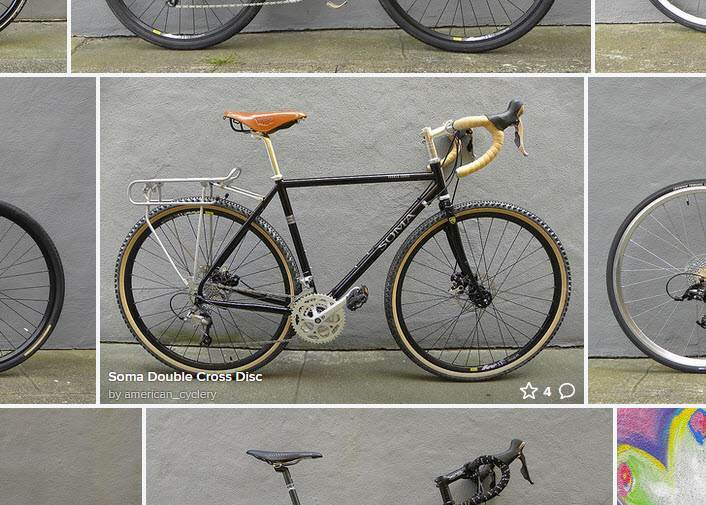 Ordering a bike this way is so nice, but can be overwhelming. Every part on the frame is a decision you have to make, but you get exactly what you want for each component. Otherwise, you'll experience frustration of a more typical bike purchase when buying a pre-assembled bike. If you're even a bit particular of this or that, it's disappointing to have to take the bike "as is". Of course you can order everything online. But you can't test ride the bike or the parts beforehand. Call me crazy in that way. 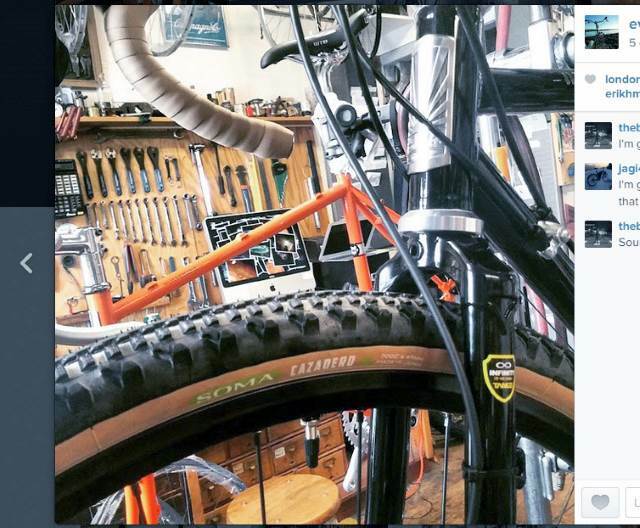 My trip to a shop like American Cyclery was certainly much less convenient, but makes the buying experience more rewarding. It was a busy day up in the bay area. I arrived early and by 3pm I was back on the BART headed to Oakland to catch a 5pm flight to Burbank. The bike was ordered, paid for and the waiting game had begun. Oh the waiting. A bike nerds worst torture. 2 weeks turned to nearly 3 and finally 'brown santa' came knocking with a big box. Hold on, drop everything. Off to my workshop for some minor assembly to bring her to life. Above: Assembled and at home. 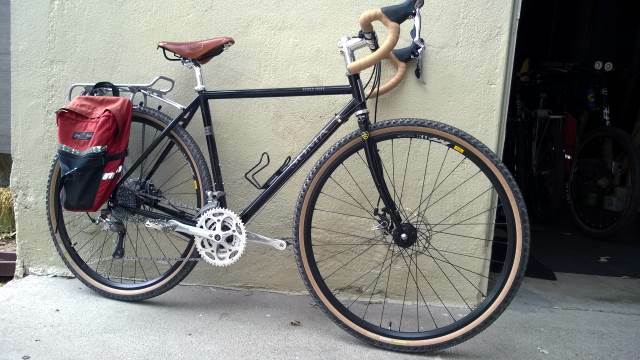 My Double Cross build combines a nice mix of old school looks and modern bike technology. I think it looks great. But what is more impressive is the ride. Seriously, I never thought a bike could ride, shift and brake so buttery smooth. And no, it's obviously not as light as a Tour de France carbon fiber race bike. Yet, it's not that heavy, is way more comfortable and thanks to the Tange Prestige heat treated chromoly frame, it should last for decades. Tell me folks, how does your latest bike purchase compare? Did you get good service? 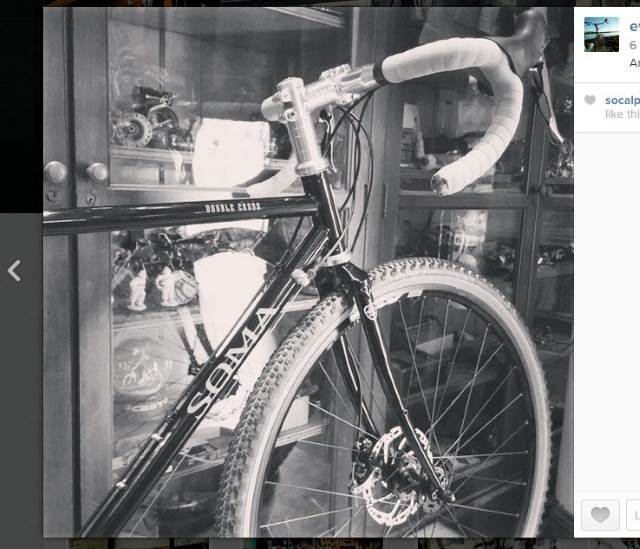 Be it Craig's List, online or traditional bike shop, let me know what your latest "New Bike Day" was like! Awesome Doug. Don't get it dirty! We should all do your commute some day on the bikes--it'd be a fun field trip for everyone (except you since you do it on a regular basis).